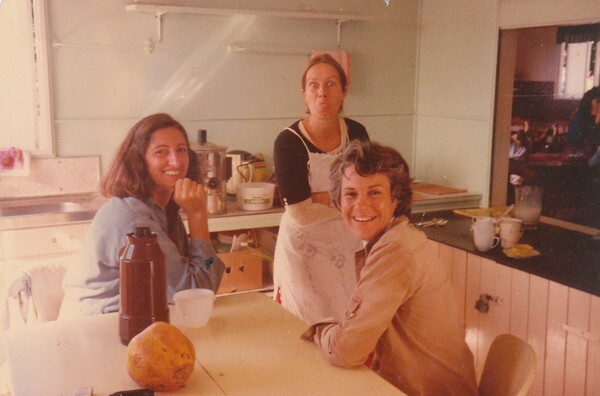 Christa Barton, Robyn Fox and Gail Perry-Somers in the CWA Hall in 1979. It all started with an idea.. In 1979, ceramic artist Christa Barton and her friend Gail Perry-Somers came up with the idea of holding a European style artisans and farmers market in Eumundi. Inspired by a visit to the community run market in Kin Kin Christa and Gail decided the CWA Hall was the best-placed venue in town. Their vision was to develop a retail base for local small crop growers and locally produced crafts, as well as offering a retail base for out of work young people – to develop their skills in handicrafts and food preparation. On 24 March 1979, three marketeers gamely set up their stalls around the CWA Hall, with refreshments served inside. There was a grand total of eight visitors and a turnover of $30. The Original Eumundi Markets was up and running. Perfectly positioned, the CWA Hall served as a refreshment room where the weary market visitor could indulge in home baked goodies, exotic foods, fresh juices or a soothing cuppa. Outside, market visitors could sit under Eumundi’s magnificent ‘Memorial Trees’, dedicated to the twenty WW1 diggers who made the supreme sacrifice. After only one year of operation, the Original Eumundi Market (OEM) gained a reputation as a source of energy, variety, freshness and friendliness, properties that still characterise it today. But it was the policy of its founders and the markets auspicing body, the Eumundi Historical Society (now the Eumundi Historical Association), led tirelessly by Valmay Templeton, that made it unique: all goods had to be locally made. As the market grows ..
By 1985, the Original Eumundi Markets had 97 stalls, with an estimated attendance of 143,000 people for the year. By 1990, it had grown to 203 stalls, with some 260,000 visitors for the year. By the early 1990’s, the Original Eumundi Markets had become a ‘must do’ destination for interstate and overseas visitors holidaying in the region. It was also the perfect distance for day trippers from Brisbane after some quality retail therapy. The Eumundi Markets today ..
Over the years, several independent entities, including the Eumundi and District Community Association, have also set up other market operations adjacent to the Original Eumundi Markets, making the overall Eumundi Markets the biggest art and craft market in Australia. Now in 2019, the markets boasts an annual visitation of about 1.2 million people. As part of the 40th anniversary celebrations the Original Eumundi Markets will treat it’s stallholders a big party after the market on Saturday 23 March and to thank he public for their ongoing supported will give away 40 fabulous prizes over 40 days in the lead up to 23 March. The Original Eumundi Market continues to be run by the Eumundi and District Historical Association (EHA), a not-for-profit association which supports local community and historic projects and has always ensured that their market has an emphasis on handmade products, with the ethos of “make it, bake it, sew it, grow it”. Discover Eumundi Heritage and Visitor Centre which is run by EHA will host an exhibition of the history on the market from Saturday 23 March until the end of May in it’s Wan’din’in Arts Space.